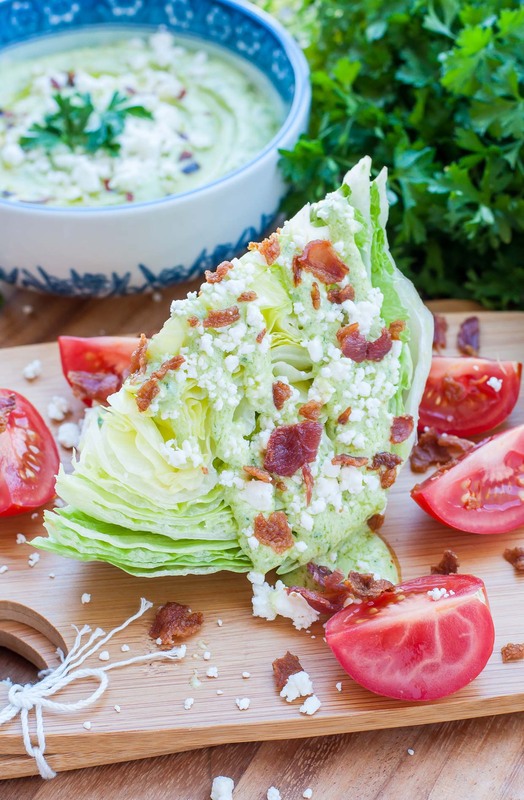 A tasty twist on the classic iceberg wedge, this green goddess wedge salad is topped with an ultra creamy dressing made with avocado, greek yogurt, feta, and herbs. 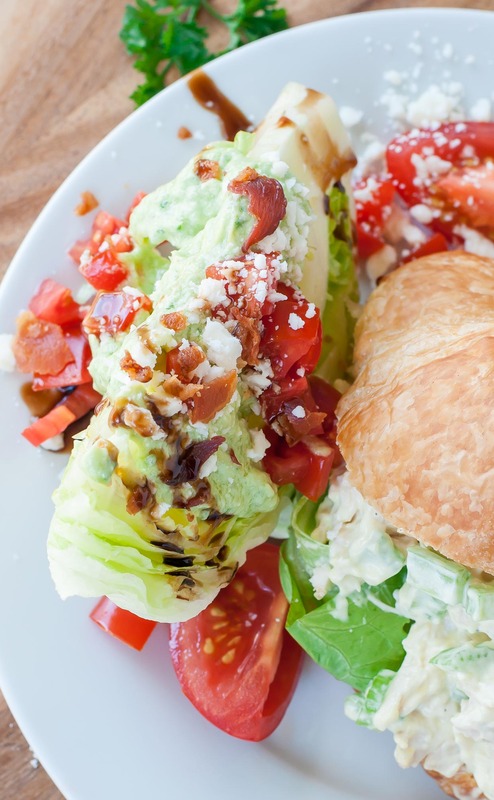 Let’s beat the heat with a sassy wedge salad topped with ultra-ripe late tomatoes, garden fresh herb dressing and a little crispy bacon for good measure. Bacon is aways in season. Of course so are bacon bits and tempeh bacon, if you’re one of my vegetarian besties. Simply make the swap and you’re ready to get your wedge on! Much like my faceplant-worthy Grits a Ya Ya recipe, this dish was inspired by one of my favorite restaurants here in Pensacola, The Fish House. Everything I’ve tried on their menu is so absolutely delicious that I should probably just commit to copycatting the entire menu at this point. That’s not obsessive, right? I love that place like woah! After moving from a town with very little non-chain restaurant options, I’m basically inundated with awesome restaurants on every corner. Yet somehow I keep going back to my favorites on repeat, typical! Does anyone else have this problem? The cravings are so real right now. Luckily I can save some cash and make a lot of my go-to restaurant dishes at home. I get it. You’re hungry. I’m hungry. Let’s EAT! Chop bacon and add to a heated skillet on medium high heat. Pan fry until crisp, then remove from pan with a slotted spoon. Blot on paper towels and set aside. Combine dressing ingredients in a food processor or blender and pulse until emulsified. To control thickness, feel free to add extra olive oil, vinegar, or water to taste, until desired thickness + flavor is reached. 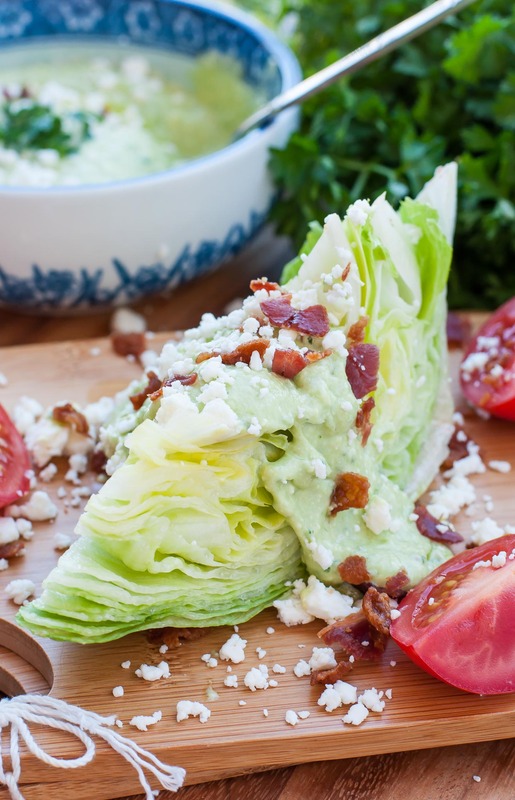 Discard wilted outer leaves of your iceberg lettuce and slice lengthwise into 4 wedges. Just before serving, top with dressing, tomatoes, feta, bacon, and optional herbs to garnish. If adding balsamic, drizzle on top and serve right away. Enjoy! No blender or food processor? No problem! 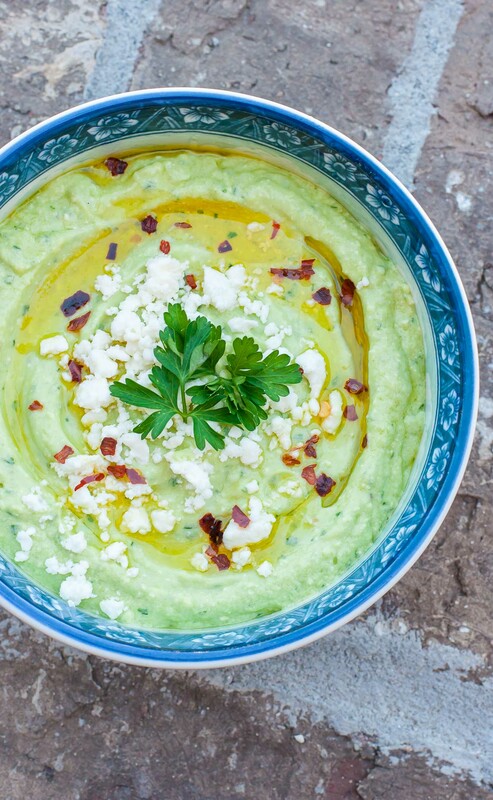 The dressing can be made by mashing the feta and avocado with a fork, mincing your green onion, parsley, and garlic, and thoroughly whisking in the remaining ingredients. 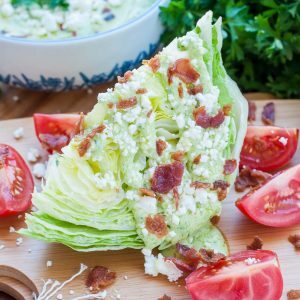 The glory of a wedge salad is how ridiculously versatile it is. Try the above dressing or make it with my beloved Creamy Feta Dressing! Red onion would also make an excellent salad topper if you’re a fan! We paired these our wedges with chicken salad sandwiches (on a croissant – delicious!) and ice cold unsweet tea.